This order form will give you an ESTIMATE only. Your actual invoice will most likely be lower than this estimate since we assume every tape or film reel to be full at normal length. 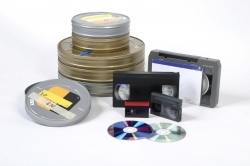 You do not pay until we have reviewed your order and determined the actual hours of tape or feet of film you have. At checkout, you only pay for a shipping/handling fee. Enter the type of media and the quantity for a subtotal. Click the “Add to Cart”. You can remove items by clicking the “x” in the Cart. Click “Checkout” when you are ready. Volume discounts may apply and, if so, they will appear after you add the item to your cart.